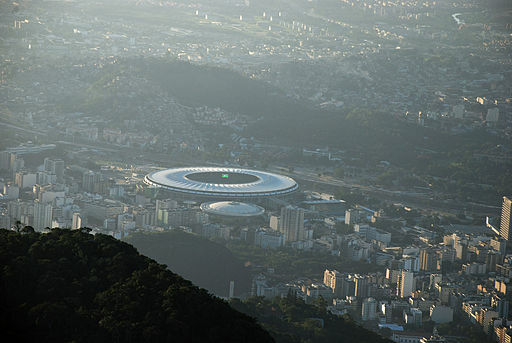 Maracana Stadium, site of the 2014 final….and site of more medical controversy? At last. we have reached the final game of the 2014 FIFA World Cup. Who will be crowned the victor, Argentina or Germany? We will soon find out. There has been plenty to write about and talk about in this tournament, which began back on June 12 at Arena Corinthians in Sao Paulo. On the sport medicine front, we have seen issues ranging from Neymar’s fractured vertebra to the concussion seen ’round the world: Uruguay’s Alvaro Pereira and his return to the pitch immediately after his injury were the focus of our post a few weeks back. I haven’t yet had the chance to discuss with you all the incident which occurred in the semi-final between Argentina and the Netherlands, involving Javier Mascherano. Since he’ll be playing for Argentina in today’s final, I thought it high time to discuss his injury and the further implications such events have for sports medicine clinicians covering sports around the world. Like many of you I was watching the semi-final live. [Full disclosure: I was rooting for Argentina (I still am….hoping for a triumph of faith over reason in today’s final!)]. For those who were watching you will remember, that Mascherano went down toward the end of the game after colliding with an opponent’s head while the two were attempting to head the ball. The medical staff worked on him for several minutes. While this was going on, my son correctly worried that should he not be able to return to the pitch, Argentina would have to play a man down, as they had already used their limit of three substitutions for the match. Like a lot of sports medicine folks watching, I was surprised to see Mascherano make it back to the pitch; it seemed clear that he had possibly suffered a concussion, and should probably have been removed. The field-side decision-making was roundly criticized subsequently. The player himself went on to perform a possibly game-saving tackle on Arjen Robbens after returning to the field. The complexity of decision-making in these settings is immense. I re-posted a blog post from our Executive Editor Chris Hughes in the wake of the Perreira incident exploring precisely this issue of same-day return-to-play clearance. The most immediate consequence of proceeding with what was arguably the correct medical call would have been to consign Argentina to playing a man down the rest of the match. It’s not difficult to start imagining parallel renderings of what ‘might have been’ for the Netherlands had Argentina finished the match a man down……without Mascherano on the field, who is there to block Robbens’ shot? All of us clinicians who manage sideline medical care face such decisions. Regarding concussions, the information is readily available, albeit still up for debate! You can go to our pages to access the 2012 Zurich Consensus Statement on Concussion in Sport, which argues against same-day return to play and argues for “Sufficient time for assessment and (that) adequate facilities should be provided for the appropriate medical assessment both on and off the field for all injured athletes” (my itals). You can go to our freely available ‘Concussion Collection,’ which contains some of the research published in our pages on this rapidly evolving field. You can even listen to our Podcast, with Canadian authors Drs. Oliver Leslie and Neil Craton, who provide a powerful critique of the Zurich statement. In all of this, I am struck by the classic public health issue of how we translate information and education into behavior change. On issues from smoking to obesity to gun safety to concussion care, time and again one can see that improved knowledge and dissemination of that information rarely, by themselves, lead to changes in health care practice. So, the sports medicine question after this World Cup’s Pereira and Mascherano injuries is how do we translate current knowledge of correct concussion management to the sideline? How do we translate knowledge into action? Put another way, as we head toward the Argentina v. Germany final: over the next four years, what do we do as professionals to ensure that similar incidents do not occur in the 2018 World Cup in Russia? With the whole world watching–in real time, as well on YouTube replay–will we start making ‘the call’ more correctly? Will there be improved translation of best practices to the highest levels of sport? Will it require unaffiliated, independent medical teams to make the potentially controversial call to pull a player at the moments of most pressure? Enjoy the game! Whoever wins, let’s hope the athletes all are safe, and receive exemplary medical care if needed! Epilogue: I am sure many of you saw the collision resulting in Kramer’s concussion. If not, go to this link: http://www.ibtimes.com/video-germany-player-concussion-christoph-kramer-taken-out-world-cup-final-1626698 How sadly ironic that the final would give us yet one more incident of a concussion mismanaged. We need to do a better job of translating knowledge into practice on the sideline and field of play. The Pereira incident really made me wonder whether the Uruguay team doc was trained in concussion care. I’d like to assume everyone is, especially with all the recent attention in the media, but I can’t even count how many patients I’ve seen for ER follow up whose concussions had been misdiagnosed, and therefore mismanaged.